Insulated/Padded bag that fits under the seat of a wheelchair. Having the bag right behind your legs makes this bag very easy to store and access your items. This bag with its adjustable straps could fit additional equipment such as a walker, scooter, and auto seat back. The straps that attach under the wheelchair and loop over the wheelchair underside rails are adjustable so this bag can accommodate different widths of wheel chairs. And the straps have side release buckles for easy on and off. The bag has a front netted pocket that works well for a cell phone. There is a water bottle holder on the front panel as well. This bag opens up wide with a zipper that runs on both sides and the top of the bag. The zipper has double zipper slides so you can access the bag from either side. Top attached handle for carrying the bag. The front of the bag can be personalized, up to 2 lines of 12 characters each. This bag comes with a free specialty patch of your choice that we will stitch on the front of the bag for you. 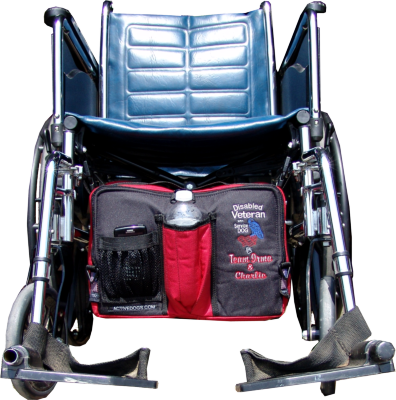 The under wheelchair bag comes in two colors they are, solid black or red/ black combination. Size is: 10” tall x 13” wide x 5” deep.